‘Postman Pat’ is one of those series that transcends generations, having appeared on TV between 1981 and 2008, reaching children of all ages spanning over two decades. I remember watching the show back in the nineties and I’m sure even those several years younger than me are somewhat familiar with Pat and his black and white cat. But we also live in a time where if it has a name, it’s going to get a big-budget movie about it and ‘Postman Pat’ is no exception. In case you weren’t aware, there will be a feature length, 3D animated film starring the man himself, simply titled ‘Postman Pat: The Movie’ and is set to debut in cinemas in May this year. Even though I was aware the project was a thing for a few years, it was just one of those things that sank into the back of my mind; into the sea of random trivia and knowledge that I don’t really need until it becomes relevant. So, once I saw the trailer, that memory rushed back and I was instantly filled with dread; a feeling that many others seem to share. One has to wonder how you take something as simple as ‘Postman Pat’ and bloat it out into a film. Yes, Pat did far more than just deliver letters, usually having to solve the problems that his fellow villagers of Greendale had, such as searching for a missing doll or retrieving a kite stuck in a tree, but those usually last about 15 minutes and are hardly material for a movie. Film’s need to be epic and have huge stakes; why do you think so many films have the fate of the world at risk? And that’s kind of the plot to this movie… sort of. The film sees a talent show called ‘You’re the One,’ hosted by Simon Cowbell, (hah! Puns) arrive in Greendale. Pat, who is voiced by Stephan Mangan (star of British comedy series, ‘Green Wing’) auditions for the competition and turns out to have a rather good singing voice (it helps that it’s Ronan Keating providing it). Pat passes and, due to having to be away from Greendale, somebody needs to do all his postal duties for him. Rather than simply hire a replacement, somebody decides to create a series of robotic duplicates instead. Got to love the leaps in logic there. And as you’d expect, these robots are actually part of a plot to take over the world and it’s up to Pat to stop them. Naturally, a lot of people aren’t happy with this. ‘Postman Pat’ is just a simple kid’s show about a postman helping people out; it’s not meant to be a grand world-saving adventure. The whole thing kind of reeks of corporate sell-out, not helped by rather basic looking animation. Postman Pat has to fight robots to save the world. Do I need to repeat that? That sounds amazing. Stupid, yes, but still amazing. There are certain things in the world of entertainment that should not be good, whether it be because they don’t make sense or are just a stupid idea in general, but you enjoy them anyway because they’re stupid and don’t make sense. And this is one of them. Not just because of the absolutely balls off the wall plot, but one certain individual is partly responsible too. David Tennant, a man most famous for his award-winning role as The Doctor (from ‘Doctor Who’ obviously) and who has starred in ‘Hamlet’ on stage, will be voicing the antagonist of the film, and if the trailer is anything to go by, he is hamming it up big time. His accent is so thick; it could probably be used as a floatation device. Tennant is one of those actors that I’d be willing to watch anything if he’s in it, especially if he’s as over-the-top as he sounds here. Also, despite what I said earlier, there seems to be some genuine heart behind this film. You could argue that the people making it clearly don’t understand what ‘Postman Pat’ is about but they’re clearly trying. I know for a fact that the reason Stephen Mangan agreed to the project is because of his children. If my dad was Postman Pat, I’d brag about it to the whole playground. David Tennant has since started appearing in more child-oriented projects like ‘Nativity 2’ once he became a dad. These people want to be able to sit down with their kids, point at the screen and say “Look, there’s Daddy.” Plus, Postman Pat is almost something of a cultural icon; he’s instantly recognisable in this country. 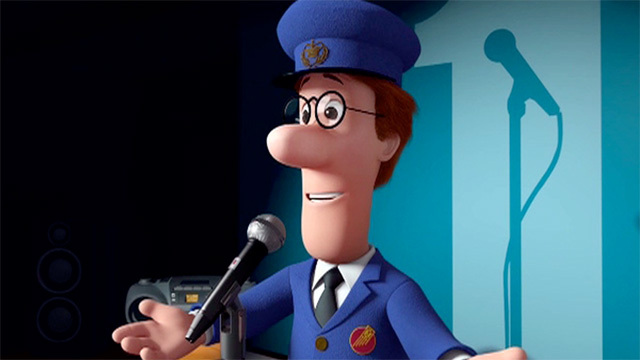 I’d guarantee that the reason the likes of Jim Broadbent and Rupert Grint would sign up for this movie is because they’ve been given the opportunity to be part of that world; to be associated with ‘Postman Pat.’ It’s a common reason for many actors’ choices of roles. We also need to remember that, while the film is based on a series that many adults grew up with, its main audience are most likely children who’ve never even heard of it. And what’s wrong with introducing the series to a new audience? Like I said at the beginning, ‘Postman Pat’ transcends generations and I can’t hate them for trying to appeal to a new audience. If I had to compare this film to another, it’d be ‘Sharknado,’ a disaster horror movie that featured a tornado made of sharks. Even though the premise itself is beyond stupid, the film still has a large fan-base, but not because they think it’s good. They love it because it’s so stupid and so bad, and that’s my mind-set in regards to the ‘Postman Pat’ movie. I don’t think it’s going to be a good movie; I think it’s going to be a ridiculous romp of epic proportions that kids will certainly love but as long as it entertains me with its utter silliness, that’s good enough for me.